Automatic and manual cantilever and tracked sliding gates available in openings from 3m to 12m. Gate is constructed with a heavy-duty aluminium beam and any infill control. Gates available in manual or automatic operation. The cantilever gate is supported from one end as it opens and closes, so there is no need for a track to be fitted across the entrance. With “no track required” across the gate opening, a cantilever gate can be installed on uneven ground and across any surface. 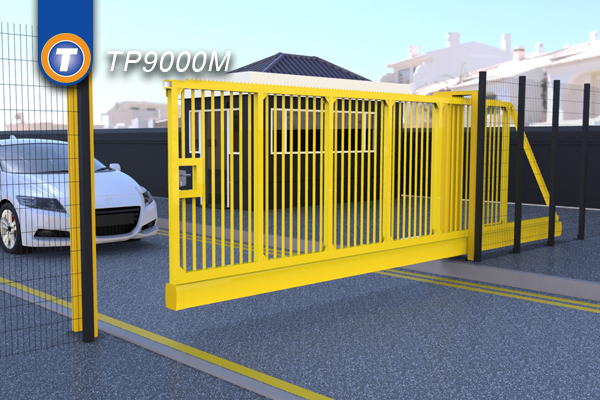 The TP9000M Cantilever Manual Sliding Gate is a cost effective, low maintenance and simple way of manually controlling access to unauthorised areas. The internal roller mechanism ensures a smooth and consistent ease of operation providing a durable and efficient service for years to come. Optional spikes line the top of the gate to deter intruders. The 6mm wall thickness, evenly spaced individual aluminium bars fitted as standard, further add to the sturdy appearance. A heavy duty locking mechanism as standard will give you peace of mind in the knowledge that the lock is as tough and secure as the gate. The manual gates share the same flexibility as the automatic range offering a vast choice of infills such as palisade, mesh and customised, which can be easily applied to the gate frame if the standard tubular bar is not suitable for the environment. The gate is delivered as a complete unit and lowered on to pre-installed concrete plinths. 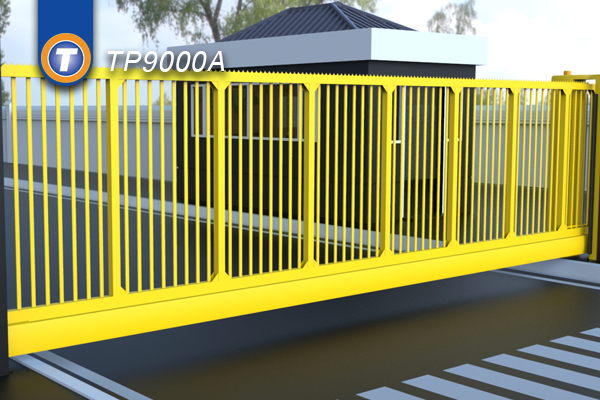 The TP9000 Automatic Cantilever Sliding Gate complies with BS/EN 12453 (the current legislation ALL automated gates must comply with). The gate portal is fitted with dual height photocells and 6 category 2/3 monitored live safety edges. The gate is controlled by a purpose made controller, single phase supply, via an integrated frequency converter controlled output to a 3 phase motor. This can be configured very easily for all the standard program modes including no passage time outs & free exit and entry loops to name a few. As standard the control panel can accommodate pedestrian open signals, airlock systems and much more. The gate’s movement is controlled via a rack & pinion system monitored by an encoder. This allows for a precise and controlled operation that is robust and dependable. The best feature of our gates is that they are fully assembled, ready to bolt down. As soon as they are commissioned they are compliant to all standards. This minimises disruption on site and leaves a beautifully finished product which will serve for many years. The gates are constructed from hi-grade aluminium which is extremely rigid and will not rust for many years to come.